Here is a printable about SHREK, FIONA, DONKEY, LORD FARQUAAD, and their corresponding ADJECTIVES about their personality. The present downloadable worksheet is meant for high school students and elementary school students at Elementary (A1), Pre-intermediate (A2) and Intermediate (B1) level. 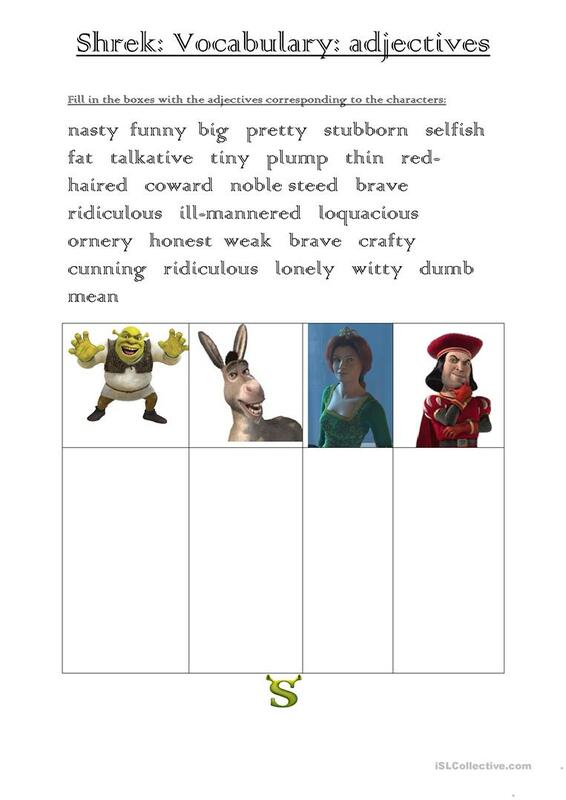 It is great for consolidating Adjectives and Adjectives to describe personality and character in English, and is a valuable material for strengthening your class' Speaking and Reading skills. It focuses on the topic and words of Personality and character. delphineraveau is from/lives in France and has been a member of iSLCollective since 2012-10-30 10:10:45. delphineraveau last logged in on 2012-12-18 14:19:26, and has shared 1 resources on iSLCollective so far.